This post on starter design materials originally appeared as a guest post at Craveity Marketing. You’re the owner of a brand spanking new business- yay! Congrats to you! Now you have to work on getting your new venture out into the world. You know that your visual branding and marketing materials are important, and you want them to be well-done. They have to live up to your awesome business idea, right? But as a small business, you also have a limited budget to get up and running. Instead of minimum viable product, you need minimum viable design. Where are you going to get the most bang for your buck? Your logo is the cornerstone of your visual branding. A well-designed logo sets you up with an aura of professionalism right from someone’s first interaction with your company. It shows that you take your business seriously, and implies that you’ll take your customers seriously, too. This is one of those times where you want to do it once and get it done right, even if it’s a bigger sticker shock up front. It’ll save you time and money down the road to not have to redo a poorly conceived or poorly executed logo again and again. And once you have a logo, even if you stick to bare bones design for the rest of your materials, you will still have that unique, high-caliber mark to set you apart. It can guide the rest of your visual branding and will elevate any marketing materials or graphics you decide to DIY. Recommendation: professionally designed if you can, but there are quality DIY options to get you started. A web presence is obviously of top importance for any business whose primary service is online or location-independent. But even brick-and-mortar businesses benefit from having a good website. The yellow pages are a thing of the past. Now if a potential customer wants to find a new business, they go one place: Google. And if you don’t have a website, you are missing out on that huge potential for new customers. A Yelp listing or Facebook page gives you some presence, but it’s not the same. It certainly doesn’t give the same professional impression that an independent website with your own domain name would have. And with how affordable it is to get a website going, you really have no excuse! Even if you can’t hire a designer at this stage of your business, you can still have a good website. Get a hosting plan for $11/month, and a domain for $12/year. Install WordPress (free! ), pick out a free theme that works for your business, add your content and you’re set. Or you can go with something like Squarespace, or Wix. Even if you need to have an online shop, there are affordable and free options. I like WordPress, because it lets you customize more and gives you room to grow as your business grows, but pick what works for you and your business. A DIY website can probably see you through the first couple of years with your new business, but, when you can, have a professional come in and revamp it. Bonus: Your own website will also let you have a custom email address (yourname @ yourbusiness.com) instead of having to use Gmail; again, just another level of professionalism. Recommendation: professionally designed if you can, but there are great templates available too. For the most part, printed design materials can wait until the need comes up. Brochures, sales sheets, etc. – those are not essential to launch for most businesses. Depending on what you do, you may not ever need any print materials other than business cards. If you have a little room left in your budget, business cards can be very handy, especially if you’re doing a lot of in-person sales or networking events. The small format is more forgiving for DIY design; you don’t need much more than your awesome new logo and contact info to get together a decent business card. The quality of printing does make a difference, though. I would recommend Moo Printing for business owners starting out. Not only do they have a great array of templates to choose from and customize, but their paper quality is top notch. A first batch of about 100 cards will get you started and not break the bank. If you can get these three design materials done well, you’ll have a solid basis for your business’ visual branding. And if you DIY any element now, consider having a professional designer rework it down the road as budget allows. Do you agree with my recommendations? What would you consider a small business owner’s most pressing design need? 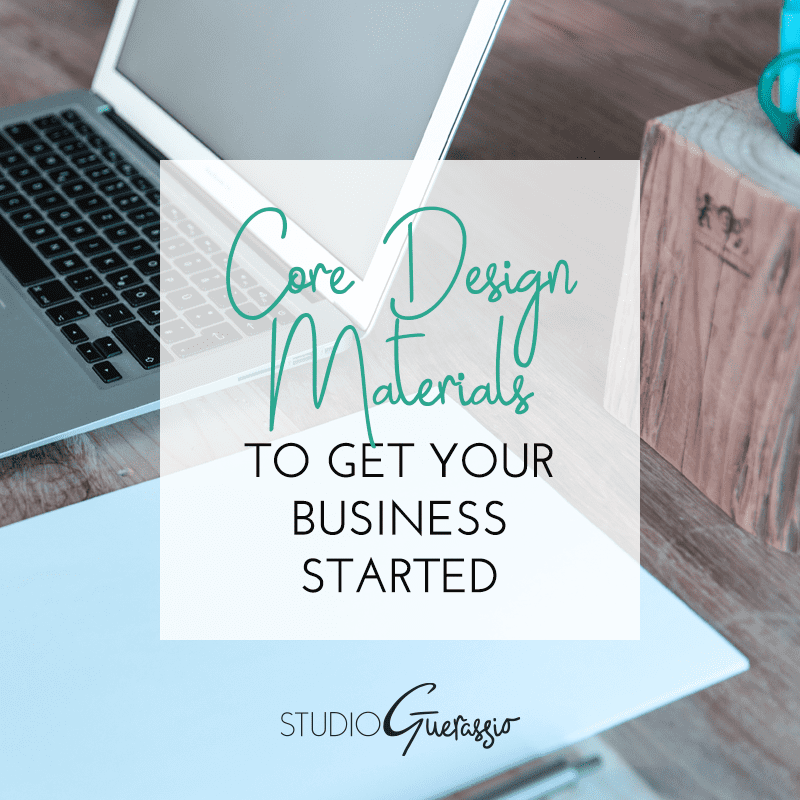 Need help with these core design materials? I’ve got just the thing for that. Check out my full branding package, specifically for new business owners.